We had play group at our house today and it was fun but I am wiped out. Harper has been PERFECT today. It's one of those days where she knew momma needed help. She took a morning nap (which RARELY happens) so I was able to get everything set up and ready. 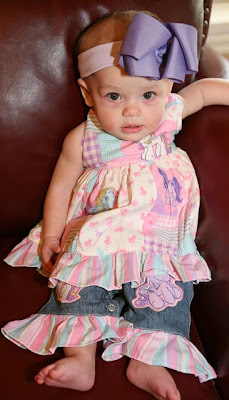 She is wearing the cutest outfit - it's my little pony and I'm just crazy about it!!! She was SO good the whole time everyone was at our house. I was so proud of her. 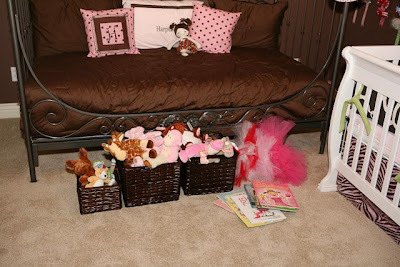 Here is her room with toys laid out all ready to go! There were 11 moms and 15 children 4 and under. That may not sound like a lot - but let me tell you it WAS. I love every single person who got to come and enjoy being with them - but that is a HOUSE full and I am worn out. Poor Harper ate and went immediately to sleep the minute they left. I have a feeling she is going to take a long nap today. I think I may have to lay down and rest myself. Harper found out today that being a hostess is hard work. But she hopes everyone will come back and play soon! She just can't wait until she is big enough to actually play too! In these pics you can kind of look at Harper and tell a little bit what she is going to look like as she gets older, know what I mean? and OK...11 MOMS, 15 CHILDREN...THAT DOES SOUND LIKE A TON!!! ha! I love the dress...but I've been looking online for those PJ's of hers, LOVE THEM!!! Those pictures of Harper are TOO CUTE!!! Love her arm over the chair! She's just adorable!!! I'd be worn out too, but it sounds like everyone had a good time! I want to come to playgroup at your house! If I start driving now, I might make by your next play date! How fun. You are obviously the perfect hostess!! Harper looks perfect (as usual). 15 kids 4 and under? Whoa!!! That is A LOT of LITTLE kids! I'm going to go lay Daisy (11mo) down for her nap now. Thanks for your blog! It is my favorite! ps: We really liked Transformers 2. Lots of comedy. A few more swear words than the first one. Great special effects. And robot violence doesn't seem to bother me. Our kids loved the first one so we took them to see this the weekend it opened. I probably should have had it pre-screened. Oops! I believe it is rated pg-13. Have a fun date! P.S. The chips and dips look good!! Here I am sitting bored out of my mind wishing I had a playdate group over at my house :) Sometimes being self-employed can be lonely just as being a SAHM can be. I love that My Little Pony outfit. That brings back lots of childhood memories. Harper's a sweetie pie! You did have a house full and managed to be the perfect hostess. The guac looks divine!!!! Harper is too cute in that last picture! She looks as if she is saying "Whew! That was hard work, Mama!" I love Harpers outfit. She looks TOo cute in it!! Glad you had fun! Looks like Harper had a great day! Her outfit is too cute. 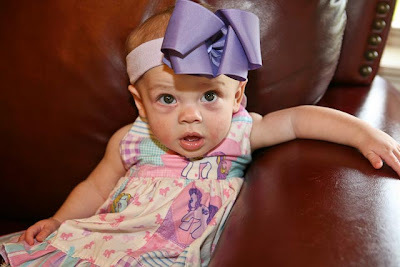 Harper looks so cute in these pictures, I didnt' think she could get any cuter! We had a great time. I knew Harper would just be worn out after watching all those kids play! It was a houseful but thanks for having us. Now go rest! That outfit is PRECIOUS! Love it! I hope you can catch up on your rest- that sounds like a huge houseful! LOL Harper looked WIPED in that last photo...such a cutie.. I see a Sonic drink in the background!!!! You did have a housefull but it looks like you were a great hostess. Glad you had fun. Hope you got some rest! Thank you so much Kelly! We had such a fun time getting to visit and eating your fabulous lunch. Yum! You are a great cook. Remind Scott he is a lucky man! LOVED Harper's outfit! She was so good and I know the 2 of you are worn out. Hope you are getting some R&R!! I remember playgroup days, they are so much work and so much fun all rolled into one. Enjoy it while you can, they grow so fast! It's my first time to comment, but I've been reading your blog for a while and enjoy it so much. The playdate looks like a lot of fun (although I'm sure a bit chaotic). :) You have a beautiful little girl! I know you're one proud mama! That outfit or hers is SO CUTE!! I am normally not a fan of character clothing but I don't know if My little Pony counts. ha ha. That is adorable! i can't WAIT to be able to have play groups at my house! Sounds like a dream! Everything looked great! That is a huge play group. The more you host them the easier they get. 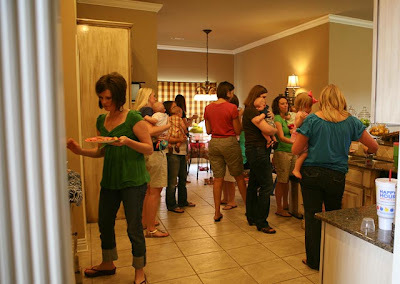 For our play groups, the hostess supplies the drinks and activities and all of the other moms bring some sort of snack for everyone to share. It really divies up the work. Good job! That last picture of Harper is WAY TO PRECIOUS! She looks SO TIRED! Awww! Looks LIKE A TON OF FUN was had by all!!! Harper looks like she just entertained thousands!! LOL!! Adorable, Kelly! Looks like a fun time. And now I'm craving chips and homemade guac. YUM! 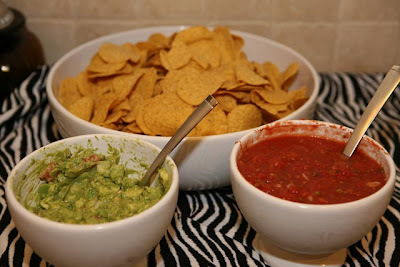 I have to say that the chips and dip (ESPECIALLY the guac) look A-MAZING! Did you make the dips yourself... I'm craving guac now :) haha! I have 2 moms over and I feel overwhelmed! Wow, you are very brave. Way to go! CA-UTE OUTFIT! Where did you get it? My daughter is in love with My Little Pony. Looks like you did great with playgroup today! Uh, that was definately a house FULL! Great playgroup!!! Did you say you wanted to be the permanent host? JK!! Harper's My Little Pony outfit was all the rage!! I can't wait to spend more time with you and Harper at the next playgroup. Thanks for inviting Brandon and I.
Mommy and Harper adn lovely hostesses. Too bad I don't ive nearby (or have little ones) or I'd have to crash the party for that yummy looking dip. Ah, those were the days. I used to have a weekly playgroup meet at our house when our first child was little. We are still friends with those kids and their families today - almost SIX YEARS LATER! In fact, I am planning a pool party with those very friends for next week. Enjoy being a mom, Kelly. It is so much fun and it's time we'll never get back. Kelly, I love Harper's picture in this outfit. My favorite part is her little arm on the arm rest like so is just hanging with mom. LOVE IT!! I just love her outfit. So glad everything went well. I am sure you were the hostess with the mostest! Harper's outfit is adorable. You are brave to have the kids out number the adults! That IS a lot of work! I'm sure this is just the beginning of get togethers for Harper!! I just started a blog this month. I just got married a month ago & I wanted to create one to keep track of my life during our sweet newlywed time before kids and after. I stumbled upon you blog and really find it encouraging. I'm big into DIY & yard sales. I'm married to a music minister & I just want to thank you for being so open about Christ. I know you get a million comments a day & I'm just another random joe commenting. But again, Thank you for being a Godly example to so many lost women blogging. I'm sure they read your blog and are prone to wonder about Him! AMEN! any comments or critique would greatly be appreciated. Kudos to you for hosting a playdate you are such a good southern belle. Little Ms. Harper will be just like you! oh my gosh she is SO ADORABLE!!! How do you stand it?!?! :) I LOVE her outfit! how fun! I should totally find and join a play group! So glad you had a good time! Harper's outfit is adorable!! I LOVE the outfit!!! I grew up watching My Little Pony, and of course Harper looks so cute in the outfit. Love your blog. Laurie was right when she called you the hostess with the mostess on her post today! You entertained a crowd! Wow! I know it was so much fun though! I hope you were able to take a nap this afternoon! Ha Ha Ha she is so cute and it looks like a great time! What a big group of people! I hope that we can afford for me to stay at home when we start a family. My mommy-friend stays home with her girls and loves it. 1. Harper in that outfit. DARLING. 2. The Sonic Route 44 on the kitchen counter. 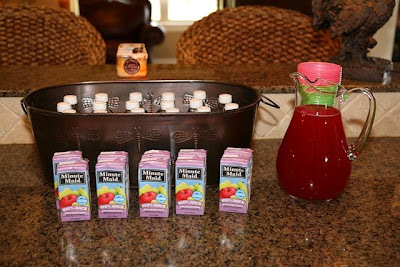 :) Mamas need their juice too! P.S. That playgroup is HUGE. What happens when you have more babies? The park maybe! What a big play group! It looks like ya'll had fun! I love Harper's bows! what a fun day! just wanted to comment on your last post. the proposal is an awesome movie, we live in texas and always go to a mexican restraunt called catina laredo. or there is always pei wei. if your into harry potter this last movie was great...have a wonderful date night!! Oh my goodness--that IS a house full! Wow! You're a great hostess though--it looks like it was a wonderful playdate!!! Oh my I think her outfit is the absolute cutest thing EVER... besides her adorable face :) I'm so glad it went well today!! Cute outfit, and the look on her face looks like..."Mom, nap now please..put down the camera"
You and Haper are the Hostess with the Moistess! ;) I could really just eat her up she is so cute! DH and I got such a kick out of Harper's post hostess photo- too cute Kelly!!!!! I love her MLP outfit! Aww, I love how you set everything up. Now that's what I call a "Full House". HAHA!! Aww I bet everyone had a great time! You are such a good hostess! I've seen it before but still can't get over how adorable Harper's nursery is!! Thia may have already been posted, but does your group ever try to make it easier on the hostess? This is what my friends and I do. The hostess picks the "theme" of the meal and everyone pitches in to bring something for the meal. The hostess usually does the main course, but not always. Taco soup, Mexican fiesta and baked potato bar ware the latest favorites. Anyway, something to try! Also I heard this quote when my DD was a baby "If you are coming to see my house, please call ahead. If you are coming to see me, come on over!" I thought it was GREAT advice and has really helped me relax more before a gathering - and that is saying a lot because I am a first-born perfectionist 100%!! girl you are such an awesome hostess. I need to take some hints from you :) P.S. I love Harper's outfit! Yes, I totally agree... hosting playdates is exhausting, but totally worth it!